In the 1996 movie, The Cable Guy, Jim Carrey stated that “The future is now.” This statement couldn’t be more relevant to pro wrestling than it is right now. With Monday’s launch of the WWE Network, the landscape of wrestling is certain to change in a number of ways. 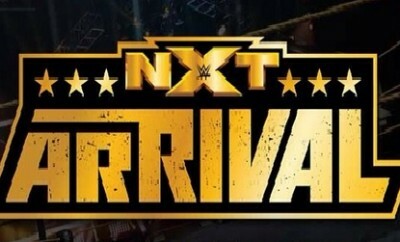 The most exciting of which could be the re-emergence of the NXT brand in the United States. Tonight’s airing of NXT ArRival on the WWE Network marks the first live airing of an NXT show, dating back to it’s inception in 2010. The PPV-style audience will give these performers a chance to shine in front of their largest audience to date. While some of them (Bo Dallas, and more recently, Emma) may be familiar to the WWE Universe, for many it will be their first introduction. The Universe is in for a treat. The other interesting factor here, is how WWE will treat the NXT “brand” going forward. In 2012, when FCW was disbanded and NXT was revived as a brand, it was largely unavilable in the United States. Their weekly TV, shown outside the US, was only available on Hulu Plus for stateside viewers. While former-NXT performers have been acknowledged as such on WWE programming, their NXT accolades have been largely ignored. Seth Rollins was the first NXT Champion, and to my knowledge they’ve never said so on television. Big E (minus the Langston) defeated Rollins for the title, and was holding the title for a short while during his run as Dolph Ziggler’s “muscle” in 2013. While there are only 3 matches thus far scheduled for tonight’s event, there are a large number of both WWE and NXT talent scheduled to make appearances. For those of you not familiar with the NXT product, I’m gonna give a “viewers guide” of sorts leading up to the event tonight. If you’ve read any of the “dirt sheets” or quasi-followed the independent scene even a little in the last two years, you’re probably familiar with Sami Zayn, even if you don’t know it. Zayn made his name on the indy scene as El Generico, a masked wrestler who rarely spoke, and when he did, “struggled” with the English language. His EG WEB TRANSLATOR on Twitter was a true throwback to the times of kayfabe. With both his, and Cesaro’s (minus the Antonio) long indy history they’ve crossed path plenty. Last year’s 2 out of 3 falls match on NXT was on many “best of 2013” lists, and I can only assume that it wasn’t included on the other lists because they haven’t seen it. With that I give you two matches to check out in preparation for what is billed as Cesaro-Zayn IV. Let me just start this by saying, the introduction of Emma to the main roster has been TURRIBLE at best. Sure, she’s comic relief, but they’ve trivialized the character by not introducing her the way that she was introduced to the NXT audience. The dance, and the skinning the cat spot are so over in NXT (links to follow), but it falls kinda flat with the way she’s been introduced on RAW. Sure, she’s easy on the eyes, but as a graduate of Lance Storm’s school, she can actually WRESTLE. Her match with Summer Rae this week showcased some of that, but in my opinion they’ve handicapped her from the get go. Then there’s Paige. The first NXT Women’s Champion. A second-generation wrestler from the UK, her mother, father, and both older brothers are all professional wrestlers. As a winner of the NXT Women’s Title tournament, she defeated former Divas Champion Alicia Fox, as well as current WWE roster member, and daughter of WWE Hall of Famer Jimmy Snuka, Tamina Snuka on her way to the finals. She met Emma in the finals of the tournament, and ultimately defeated her. In 2013, PWI ranked her as the 13th best female wrestler in the world in their yearly rankings of the top 50. Dubbing herself as the “anti-diva” she’s certainly poised to make the main roster at some point this year. I think this match poses some interesting questions to the way that NXT is presented going forward. In my opinion, with the fumbling of Emma’s introduction to RAW, she needs the title to get over. Paige hasn’t been called up yet, so being defeated by a member of the main roster isn’t an “upset”, or anything that would hurt her push in NXT. Barring a possible call-up for Paige, I think that would be the route to go, but tonight we shall see. With that I give you a couple of things to watch before their encounter. The two best “divas” matches I’ve seen on NXT recently. The first is Emma vs. Paige in the tournament finals, just do me a favor and pay attention to Emma’s entrance and how over she is with the crowd. The second is Paige vs. Natalya from a couple of weeks ago, which might be the best “divas” match I’ve seen in some time. Another thing to possibly look forward to during this match is the inclusion of Renee Young on commentary. She’s been included for women’s matches recently, and has been a bright spot on NXT programming. With Bray Wyatt having moved onto the main roster, there is one Rotunda brother left to inherit the NXT, and that man is Bo Dallas. After defeating Big E (minus the Langston), he has led the Bo-lievers, and carried the NXT Title for a now record 280 days and counting. Of course, there was also a very short-lived feud with Wade Barrett, but let’s not dwell on failed opportunities. While I’m not a big fan of Dallas as a performer, I do enjoy his promos. That being said, I think being paired with Adrian Neville in this match will do wonders for his career. Adrian Neville (formerly known as Pac) is quite the opposite. He lets his in-ring work speak for itself, and his promos leave a bit to be desired. Another English born wrestler, he has been billed as “The Man Gravity Forgot.” Once you see his Red Arrow finisher, you’ll understand why. 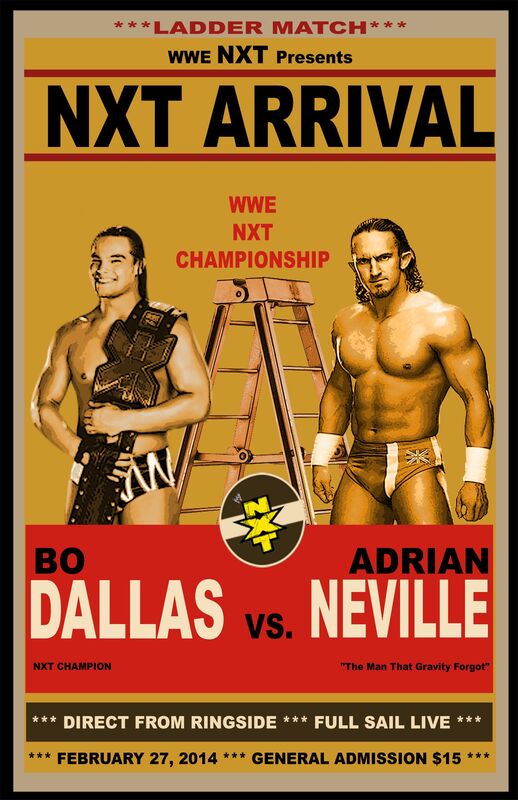 I think Adrian Neville holds the key to this match, being the Shawn Michaels to Bo Dallas’ Razor Ramon. That being said, I’ll include a couple of Pac matches, and a Bo Dallas interview to give you guys a taste. They’re essentially in the main event spot of what could be considered a PPV, with the recent WWE Network restructuring. Bo Dallas’ highlight reel isn’t much to speak about, but Pac’s is quite the opposite. With that said I’ll include a couple of Pac matches from ROH/NJPW and a Bo Dallas promo. As you can tell I’m excited about NXT ArRival, I hope you are too! Share your thoughts in the comments before and throughout the event and follow me at @RebookTheFinish to hear my thoughts throughout!